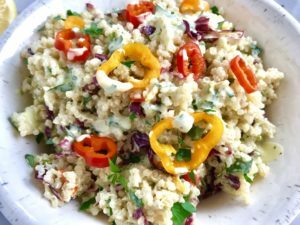 Veggie Quinoa Salad with Creamy Lemon Dressing is loaded with flavor, texture, color and is both delicious and nutritious! 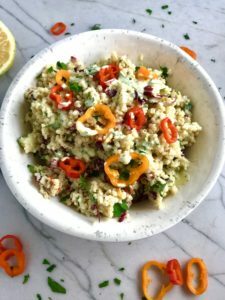 This Veggie Quinoa Salad has so many fresh and flavorful vegetables including cucumber, sweet peppers, radicchio, scallions, and parsley. 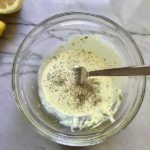 The dressing is a bright Creamy Lemon Dressing with Lemon, honey, mustard, and sour cream. It is seriously my go-to breakfast, lunch, dinner, & snack dish that I love keep on hand all the time! 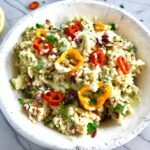 Veggie Quinoa Salad is also a great meal prep dish that you can pack into several lunch containers for the family for the week! 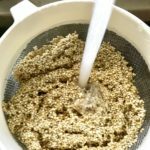 Get on the Quinoa bandwagon! Quinoa is often referred to as a Superfood because it has so many health benefits. First, it is high in protein with 1 Cup of cooked quinoa containing 8g of complete protein. To give you an idea of what that means, 1 egg has 6g of protein, so you can see that this is a great addition to any vegetarian meal or diet! Quinoa also has Iron, the antioxidant Manganese, Lysine for tissue growth and repair, as well as magnesium, which promotes healthy blood sugar control, energy production, and the formation of healthy bones and teeth. Last, but not least, Quinoa is high in Riboflavin (B2), which improves energy metabolism. It is seriously a Superfood! 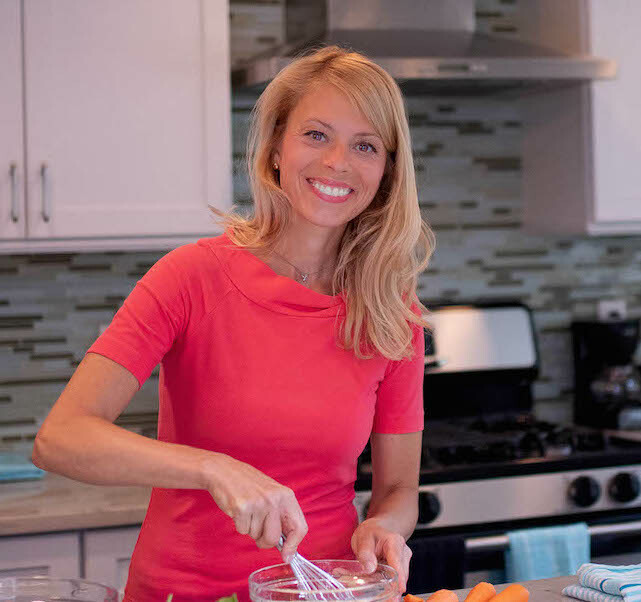 Check out my Quinoa Weekly Meal Plan HERE! We are all extremely busy and making dinner during the week can be overwhelming. Here is my recommendation for making dinner easier: make your own kits! On Sunday, prep all of the ingredients and store them in the fridge on meal-specific pans or bowls. Then on the night you cook, everything is ready to go! Bonus!! This entire recipe can be made in advance and stored in the fridge for up to 5 days. 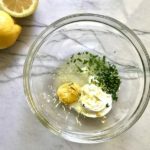 For the Creamy Lemon Dressing, I love the flavor that yellow mustard brings. It is tangier than dijon and works incredibly well with lemon, sour cream, and honey. First, zest the Lemon and then cut in half and add the juice from only Half of the lemon to a small bowl. Also to the bowl, add the sour cream, lemon zest, honey, yellow mustard, parsley. Whisk the ingredients together. Add a dash of salt and fresh ground pepper. Taste for seasoning and add more salt & pepper if needed. Add the Creamy Lemon Dressing to the Quinoa Salad and mix with a large fork. Taste for seasoning and add more salt & pepper if needed. Enjoy!! 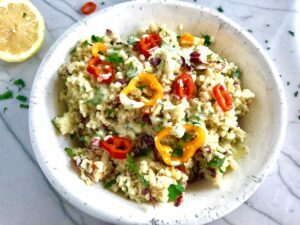 Veggie Quinoa Salad with Creamy Lemon Dressing is loaded with flavor, texture, color and is both delicious and nutritious! 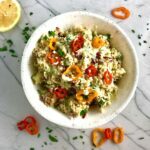 This Quinoa Veggie Salad has cucumber, sweet peppers, radicchio, scallions, and parsley. 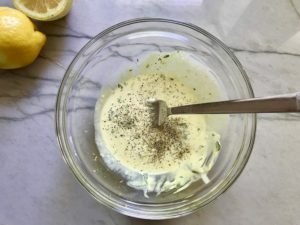 The dressing is a bright Creamy Lemon Dressing with Lemon, honey, mustard, and sour cream. 1/2 cup Red Pepper use orange or yellow too for more color! 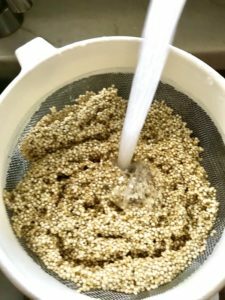 Cook the quinoa according to package instructions. Let cool in the fridge. Wash and dice the cucumber. Note: If you have an English cucumber, keep the skin on. If a regular cucumber, then peel and discard the waxy tough skin. Slice the Radicchio. Dice the pepper. Chop the parsley. Finely slice the scallion, using only the greens for this salad, but save the whites for another recipe. Zest the Lemon and then cut in half. 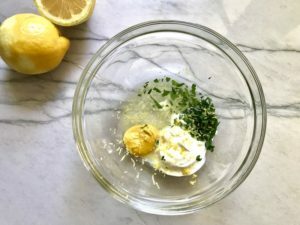 In a small bowl, add the sour cream, lemon zest, juice from half of the lemon, honey, yellow mustard, parsley. Whisk ingredients together. Add a dash of salt and fresh ground pepper. Taste for seasoning and add more salt & pepper if needed. 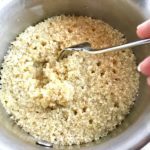 I’ve been trying to get my children to eat more superfoods like quinoa – I tried making this for them and they absolutely loved it. Thanks!